December 4 – 6:30 to 8:30 PM Community Meeting, John Stanford Center, 2445 3rd Avenue South. Debbie Taylor was quoted on KUOW. If you have time for coffee @ 9:00 AM today, join me at Coffee to a Tea with Sugar in the Junction, where we can chat with West Seattle’s School Board rep Steve Sundquist. It may be standing room only. 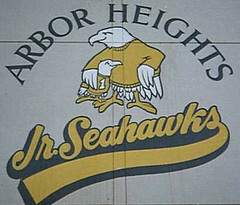 Arbor Heights is home to the Jr. Seahawk Newsletter, the oldest continually published student newspaper on the Internet, going back to 1994, with all editions available online, and several available as podcasts, available on iTunes, of course. Volume 18, Issue 2 will be out the day before Thanksgiving, 2008. Student news reporters have their own blog. Please use your full name. Anonymous comments will not be published.